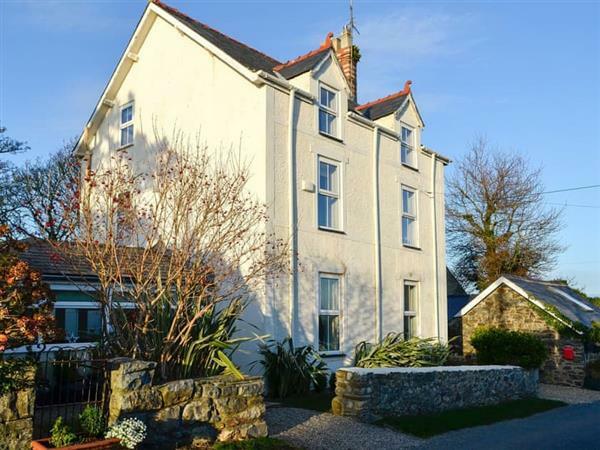 Goleufryn in Abersoch, Gwynedd sleeps 18 people. Goleufryn in Abersoch has a lovely quiet location; Goleufryn is split over three buildings grouped around a pretty garden, just on the outskirts of Abersoch on the Llyn Peninsula, and has distant sea views. The main house sleeps ten and has a spacious living room with a dining room and full kitchen where everybody can gather together. The Barn sleeps four, has a smaller living room and kitchenette together with two bedrooms, and The Annexe sleeps four in one bedroom and also has a fantastic games room to keep the whole family occupied. There are walks from the door, and the pretty village of Abersoch is a short distance away, providing a range of shops, pubs, cafés and restaurants. There are three beaches to choose from too, the long sandy Warren Beach, small and sheltered Porth Bach, and sandy Porth Ceiriad, backed by high cliffs. There’s also the surfers favourite at nearby Hell’s Mouth. Abersoch itself is well-known as one of the most popular sailing venues in North Wales, but it also makes an ideal base for exploring the area. Visit the lovely National Trust owned beach at Llanbedrog with its multi-coloured beach huts, and call in to see the ever-changing art exhibitions at Plas Glyn-y-Weddw. Take a trip from Aberdaron to visit Bardsey Island off the tip of the Llyn Peninsula, or take a trip into the Snowdonia National Park on the Welsh Highland Railway, visit the quirky Italianate village of Portmeirion, or conquer mighty Caernarfon Castle, built by Edward I and now a UNESCO World Heritage Site. You will find the beach, shop, pub and restaurant ½ mile from Goleufryn in Abersoch. 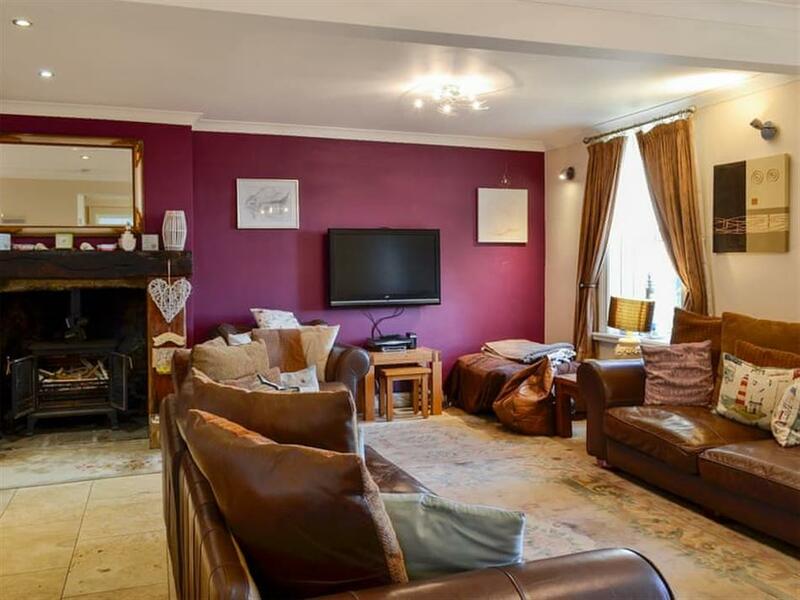 Living area: With wood burner, 40 Freeview TV and tiled floor. Dining room: With tiled floor and French doors leading to courtyard. Kitchen: With electric cooker, microwave, fridge, freezer, dishwasher and tiled floor. Living/dining room: With wood burner and tiled floor. Kitchen: With microwave, fridge/freezer, washing machine and tiled floor (no sink). Games room: With pool table, table football and darts. Bedroom: With double bed, single bed, pull-out bed and en-suite with shower cubicle and toilet. Bedroom 1: With king-size bed, Freeview TV and en-suite with bath, shower cubicle and toilet. Bedroom 3: With king-size bed, single bed, pull-out bed and Freeview TV. Oil central heating, electric heating (in The Barn and The Annexe), electricity, bed linen, towels and Wi-Fi included. Initial logs for wood burners included. 3 travel cots and highchair available on request. Garden, courtyard with patio, garden furniture, barbeque and chiminea. Private parking for 4 cars. No smoking. Please note: There are 3 steps in the courtyard. Holidays at Goleufryn run from Monday to Monday. For a better idea of where Goleufryn is, you can see Goleufryn on the map below. Goleufryn is in Gwynedd; should you be on the lookout for a special offer, you can find all the special offers in Gwynedd. It's always worth checking to see what is on offer at the moment. Do you want to holiday near Goleufryn (UK10379), you can see other cottages within 25 miles of Goleufryn; have a look to find your perfect holiday location.